To implement the rural vitalization strategy in China, a green path for development is essential. The country needs to coordinate systemic governance of mountains, waters, forests, farmland, lakes and grasslands, enhance the supply of ecological products and services, preserve food security and tackle environmental pollution to realize the goals of strong agriculture, beautiful villages and prosperous farmers. Rural vitalization should be guided by the new development philosophy and enable people to overcome homesickness. Many people have returned to the countryside only to be disappointed by the fact that the beautiful homes in their memories had been polluted away. Chinese President Xi Jinping, also general secretary of the Communist Party of China (CPC) Central Committee, noted that the people should be able to see green mountains and clear waters, and have hometowns capable of anchoring their nostalgia. He added that we should protect the environment like we protect our eyes and treat the environment like it is our lives. Rural vitalization requires long-term vision based on the current situation. China will follow the principle of “green mountains and clear waters are invaluable assets,”and promote economic and social development that aligns with environmental protection. Making rural areas more pleasant places to live is a target set by the Central Rural Work Conference, as well as the core driver of the rural vitalization strategy. China should seek development that is for, by and of the people, and make more effective institutional arrangements so that people will more easily sense the gains of joint construction and shared development. This strategy will help development gain more momentum and unite the people along the road to common prosperity. China’s economic prosperity boosts the sustainable development of its rural areas, both economically and socially. 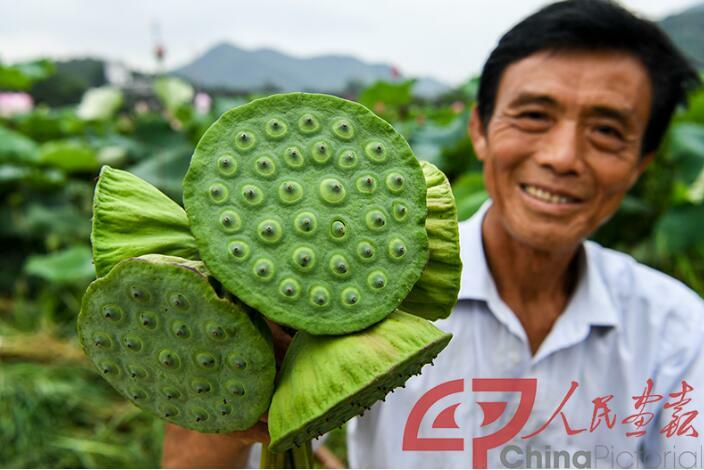 The supply-side structural reform can be promoted by developing agriculture with distinctive features and building brands. Value chains can be extended through the integration of planting, breeding and processing industries. Brand building, industrialization and coordinated development should be enhanced. The principle of developing green and high-quality agriculture should be practiced in agricultural production, product processing and waste recycling. More organic food should be produced. Instead of growth based on quantity, China’s agricultural sector should pursue quality and branding, and produce high-quality, healthy and green agricultural products to maintain grain security. Forest economics, ecological tourism and special towns should be developed to benefit rural people. The principal contradiction facing Chinese society is the one between unbalanced and inadequate development and the people’s ever-growing need for a better life. Alongside physical wealth and spiritual treasure, more high-quality ecological products should also be created to satisfy the increasing demands. Environmental protection is tremendously significant to the rural vitalization strategy. The strategy cannot be implemented at the expense of the environment. To win the battle for blue skies, straw burning should be regulated and small-sized coal ovens with high efficiency and close-to-zero emissions should be promoted in rural areas of northern China where heat is used most in winter. Urban-rural water supply and sewage treatment should be coordinated, and environmentally friendly methods should be used to improve sewage treatment in rural areas. Projects to upgrade restrooms and water facilities should continue to safeguard water safety in the countryside. Waste recycling patterns—classified at the residential level, collected at the village level, transported at the town level and processed at the county level—should be promoted to activate the cycle to minimize waste and generate energy. Environmental law enforcement should be strengthened in rural areas to prevent urban and industrial pollution from being transferred to the countryside. To achieve sustainable rural vitalization in China, pre-assessment,in-process supervision and appraisal of agricultural production are also required. The fundamental role the market plays in distributing resources as well as the government’s function should both be given full play in rural vitalization. Special funds should be launched to increase investment in environmental protection in rural areas, so sufficient and cost-effective ecological products and services are made available to enterprises when they participate in rural construction. Many benefits can be produced by the system that holds local Party and government leaders accountable for environmental protection and implements compensation in accordance with performance in environmental protection. The system favors common prosperity and prevents problems. It motivates the public and helps increase forest coverage to improve the environment. Advanced applicable technologies and integral renovation should be utilized and promoted. Performance-driven methods and third-party supervision of pollution prevention and control, as well as post evaluation of construction projects, are needed to minimize the cost of improving the rural environment. Simple language and down-to-earth methods will help increase public awareness of environmental protection and sustainable development. Exchange activities concerning environmental protection should be conducted to motivate villagers to take part in environmental governance by performing tasks such as garbage classification, helping them gain a sense of pride and honor in constructing beautiful villages. Many tiny drops make a mighty ocean. Everyone’s efforts will inject vitality into the construction of the beautiful countryside as rural China walks the green path of development. Under the leadership of the CPC Central Committee with Xi Jinping at the core, Chinese people are working together, and the rural vitalization strategy is fostering thriving businesses, pleasant living environments, improved social etiquette, effective governance and prosperity in rural areas of China. Hopefully, agriculture will become a promising industry, farming will become an attractive profession, and rural areas will transform into appealing places to live and work. The author is a researcher with the Department of Social Development under the Development Research Center of the State Council.